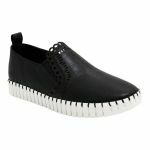 Hannan by Django & Juliette is a comfortable and stylish slip-on flat. You would wear Hannan as an everyday casual flat. Hannan has a removable innersole making it orthotic friendly. 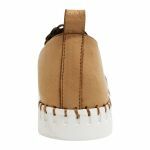 Hannan is made from soft moldable leather and has elastic gussets for fit. Hannan has a beautiful decorative laser-cut pattern and a scalloped edge. Hannan has an oval-shaped toe that has a narrow to average fit. 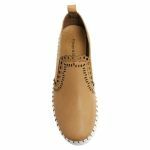 Hannan has a built-up treaded sole that makes it a great shoe for walking and sight-seeing when travelling.